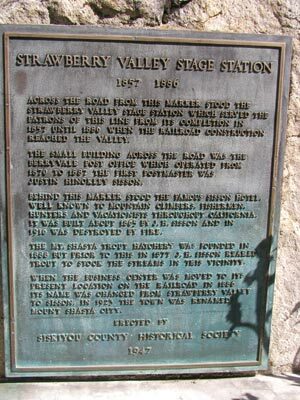 Across the road from this marker stood the Strawberry Valley Stage Station which served the patrons of this line from its completion in 1857 until 1886 when the railroad construction reached the valley. The small building across the road was the Berryvale post office which operated from 1870 to 1887. The first postmaster was Justin Hinckley Sisson. Behind this marker stood the famous Sisson Hotel, well known to mountain climbers, fishermen, hunters and vacationists throughout California. It was built about 1865 by J.H. Sisson and in 1916 was destroyed by fire. The Mt. Shasta Trout Hatchery was founded in 1888 but prior to this in 1877 J. H. Sisson reared trout to stock the streams in this vicinity. When the business center was moved to its present location on the railroad in 1886 its name was changed from Strawberry Valley to Sisson. In 1923 the town was renamed Mount Shasta City. NW corner of W Jessie St and Old Stage Rd, 1 mi W of Mt Shasta.